Mountain Lions in Virginia, Yes? No? they begin their long trip to Mexico. 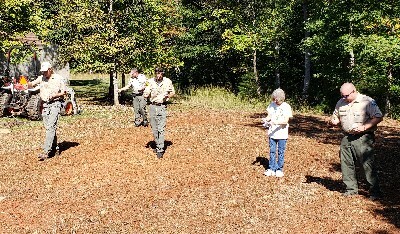 Distributing wildflower and milkweed seeds, from left, James Watling, District Resource Special Assistant, Sean Dixon, Assistant Manager, Reed Stanley, District V Resource Manager, Patti Gerhart, Friends of Smith Mountain Lake State Park, Jared Vandergriff, Chief Ranger. Stanley is responsible for managing the resources for the six parks in the district; Claytor Lake, Fairy Stone, Occoneechee, Smith Mountain Lake, Staunton River and Staunton River Battlefield State Parks. He said that two years ago, he finely got some wildflower seed that had no grass in it, which is costly. He has had some success, but he continually battles switchgrass which is invasive. For SML State Park, he selected an area near the Visitor Center measuring about 40 ft. by 80 ft., with plenty of exposure to the sun. The area was treated with herbicide and recently tilled and raked. Stanley brought with him an assortment of seeds which will produce native plants. He said this is important because the native plants have evolved over time and adapted to the climate, soils, rainfall, drought and interaction with other species. The list of seeds includes coreopsis, partridge pea, milkweed, spotted beebalm, black-eyed Susan, Indian blanket, purple cone flower, black & brown eyed Susan and others. 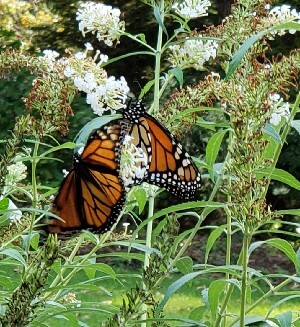 The Friends of the State Park also contributed 1,000 common milkweed seeds because the entire life cycle of the monarch butterfly depends on milkweed. The seeds were distributed by hand then the area was lightly raked. Stanley said the seeds require a period of stratification. A process where the seeds are subjected to low temperatures for a period of time in order for germination to take place. This is a natural process when seeds are shed in autumn. Stanley said the second year after planting is better because the ground has been recently disturbed, unearthing numerous unwanted seeds. He said if all goes well, there should be plenty of wildflowers available next summer to attract the pollinators.